Last week’s Music in the Park concert feature PanJGea!, a steel drum band from John Glenn High School in New Concord, Ohio. It was a bit nippy, with temperatures in the 60s and a breeze, but the band, numbering more than 20 high school students, entertained and had the audience at the Heise Park band shell clapping their hands and tapping their feet to variety of different types of music featuring the hand-made steel drums. Next week’s concert, on June 13, showcases United in Harmony, an all-male, 23-member choir from Crawford County that sings a little bit of everything, from doo-wop to contemporary. Come hungry to Tuesday’s show as staff and directors of Snyder Funeral Homes Richardson Davis Chapel will prepare a traditional American picnic dinner. They will have available grilled hot dogs, lemon shakes and more. Snyder Funeral Homes Richardson Davis Chapel sponsors the concert series, which runs through June 27. The music starts at 7 p.m. Tuesday, but the food will be available starting at 6 p.m. So come early and get a bite to eat before the musical entertainment starts. Russ Kent | Galion Inquirer Last week’s Music in the Park concert feature PanJGea!, a steel drum band from John Glenn High School in New Concord, Ohio. It was a bit nippy, with temperatures in the 60s and a breeze, but the band, numbering more than 20 high school students, entertained and had the audience at the Heise Park band shell clapping their hands and tapping their feet to variety of different types of music featuring the hand-made steel drums. Next week’s concert, on June 13, showcases United in Harmony, an all-male, 23-member choir from Crawford County that sings a little bit of everything, from doo-wop to contemporary. Come hungry to Tuesday’s show as staff and directors of Snyder Funeral Homes Richardson Davis Chapel will prepare a traditional American picnic dinner. They will have available grilled hot dogs, lemon shakes and more. Snyder Funeral Homes Richardson Davis Chapel sponsors the concert series, which runs through June 27. The music starts at 7 p.m. Tuesday, but the food will be available starting at 6 p.m. So come early and get a bite to eat before the musical entertainment starts. 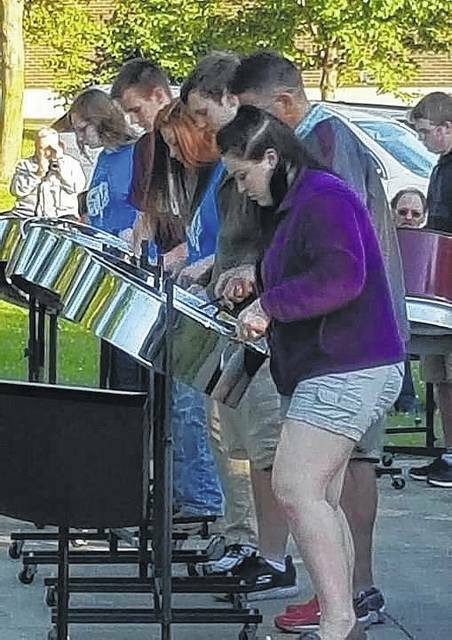 http://aimmedianetwork.com/wp-content/uploads/sites/38/2017/06/web1_steel-band-2.jpgRuss Kent | Galion Inquirer Last week’s Music in the Park concert feature PanJGea!, a steel drum band from John Glenn High School in New Concord, Ohio. It was a bit nippy, with temperatures in the 60s and a breeze, but the band, numbering more than 20 high school students, entertained and had the audience at the Heise Park band shell clapping their hands and tapping their feet to variety of different types of music featuring the hand-made steel drums. Next week’s concert, on June 13, showcases United in Harmony, an all-male, 23-member choir from Crawford County that sings a little bit of everything, from doo-wop to contemporary. Come hungry to Tuesday’s show as staff and directors of Snyder Funeral Homes Richardson Davis Chapel will prepare a traditional American picnic dinner. They will have available grilled hot dogs, lemon shakes and more. Snyder Funeral Homes Richardson Davis Chapel sponsors the concert series, which runs through June 27. The music starts at 7 p.m. Tuesday, but the food will be available starting at 6 p.m. So come early and get a bite to eat before the musical entertainment starts.